Governor Snyder said that China is an important cooperative partner of Michigan. The two sides have maintained a sound and friendly relationship in the past years. He welcomed more Chinese enterprises to invest in Michigan, and hoped to deepen the exchanges and cooperation with China in the extensive fields of agriculture, education and tourism. 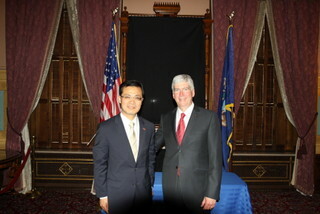 Consul General Zhao appreciated the great importance Governor Snyder had attached to the China-Michigan Relations. He said that Michigan was not only the automobile capital of the world, but also had a strong advantage in the extensive areas, such as agriculture, education and tourism. He looked forward to working together with the Michigan side to achieve new developments in the friendly cooperative relationship between China and Michigan.